With April Fool’s day just passing many people were extremely wary of news related to gaming just in case their hopes and dreams are ruined due to being misinformed. I must admit I was fooled when I thought that the Master Chief Collection would be coming to the Nintendo Switch but boy how silly did I look when I told people this. 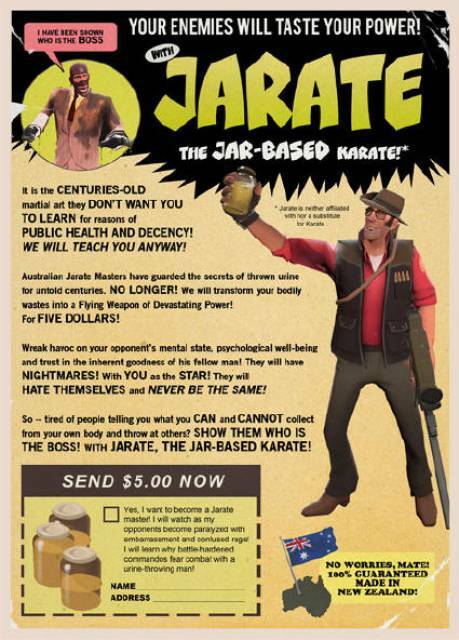 When I think of the best April Fool’s jokes related to gaming however the standout one would have to be Valve’s implementation of the item known as ‘Jarate’ within Team Fortress 2. When Valve was still largely supportive of the game they released this image as seen above as a joke for the internet to laugh at. However what people didn’t know was that not too long after this item actually ended up in the game as a usable weapon for Sniper. Even funnier this is considered one of his most powerful sidearm weapons and many people cannot think of the Sniper without considering his scarily large bladder. I hope to see other developers make April Fools jokes and then do end up putting their jokes into practice. Please 343 make the MCC onto the Switch… That’s all for now, and as always. It’s not just a game, It’s a Life.